Hi, I’m Molly Higgins, a librarian at the Lamar Soutter Library, University of Massachusetts Medical School. Today we’re going to talk about planning your search because planning ahead saves a lot of work in the long run. One part of planning is choosing your database(s). Maybe you’re used to using Google for everything. 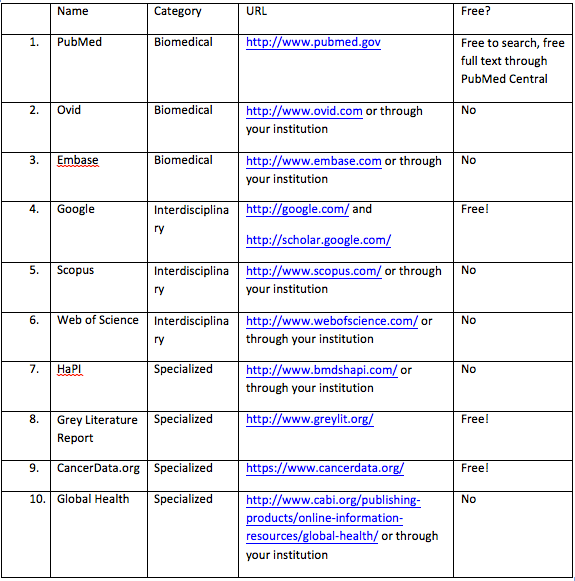 Maybe you use PubMed when you’re searching for scholarly literature. They’re both awesome tools, but if you only have a hammer then every problem is a nail. Research and evaluation needs are not nails. The goal of this post is to expand your toolbox so that you can pick the right tools for the right jobs. What they do: PubMed is great because it’s so specific. You can trust it to bring up reliable biomedical research and evaluation information because it searches Medline. Medline is a database with over 21 million citations and adding more every day. And because it has the specialized thesaurus MeSH, you can search for very specific topics. Ovid and Embase also search Medline, but the functionality is different, so they’ll give you slightly different results. This is great for systematic reviews—it’s like double checking your work. What they do: Huge, wide-ranging databases are a great place to start your search if you don’t know what you’re looking for; if you’re doing interdisciplinary work; or you’re looking for non-scholarly/ unpublished work. Big academic databases sometimes have cool tools, like citation mappers. What they are: HaPI, Grey Literature Report, CancerData.org, Global Health, etc. What they do: It depends! If you’re looking for a specific type of resource, try a specialized database. I’ve highlighted a few. HaPI (Health and Psychosocial Instruments): My go to place for tested, reliable assessment instruments (questionnaires, rating scales, interview forms, etc.) for health and behavioral sciences. If I didn’t have HaPI, I’d be sad. Grey Literature Report: My colleague Len will talk grey literature in a later blog post, so if you’re not excited now, you will be. The Report is one place to go to look for grey literature. CancerData.org: One of many data repositories where you can download data for secondary research, or to verify someone else’s work. Global Health: Covers public health topics for the US and internationally. If you’re a public health researcher or evaluator, you probably don’t consider this a specialized database.